MAKE SURE YOU READ THIS. Only order this CPU cooler if you have an CPU_OPT or a CPU_FAN2 port on your motherboard. Unlike Corsairs header where it makes all the voltage run through the CPU_FAN port, Deepcool decided to be smart and not overload the port. The two fans run off a controller that plug into the optional port, and the pump itself runs with the CPU fan port. The cooler is fantastic for the price, you can get it on Newegg for $90, I'm not sure why partpicker doesn't show that, but it keeps my CPU well under 30 degrees Celsius but high enough to avoid condensation. Works very well under pressure and I've been able to game for hours and it's able to keep it under control. Highly recommended! So far this thing is great, we will see how cool it keeps the CPU after Overclock. So far I have not seen the CPU go over 63C under full load. I love the look and it's a great price point. The only downside is the LED in the CPU fan only is consistent when the fan is at full speed. If you want to see the constant LED pulse you have to run full speed or hook the wiring direct to the PS. from completed build Fantastic 16 core Sketchup and rendering machine! Super happy. Looks great, keeps my cpus super frosty (~30C idle and 43C at load), and the sound levels are fantastic! I have to try to hear them in a quiet room just to be able to hear the fans run. I have two of them on a dual processor system and the breathing effect is really cool. No they cannot be synced up together, but I rather like the offset breathing...looks really interesting behind the dark glass of my case. I would totally recommend this cooler. Just installed it last night. Started it up and Im already noticing the difference. Had to find a place to put the rad but figured that out. Deepcool case, deepcool Captain 240EX seemed like a no brainer. 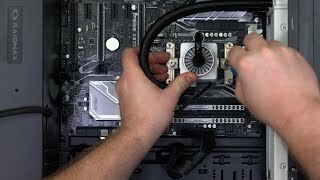 LOVE this AIO watercooler for functionality and looks. Totally fits the bill in my build and I highly recommend it. CPU temps are idling at around 30 degrees celcius and under full load being overclocked at 4.6 GHz and gamed on for several hours have yet to see a temp above 55 degrees celcius. looks awesome and keeps my CPU at low temps! Also very quite. Adds a beautiful touch to my white build. Overkill to start but at least its ready for a more demanding CPU to OC. I bought this cooler primarily for aesthetic purposes, and maybe other than the newer Kraken models, I think this is the best looking CLC available. There is almost no noise at idle, and the stock fans are tolerable even at full RPM. Mounting is very intuitive and easy; my only complaint, and the reason I took off a star, is that it is not possible to front mount with the hoses at the bottom of the radiator without seriously twisting the hoses and risk kinking them. I have heard that orientation is easier on the pump and quieter as air will not be sucked through the loop.